Your Daily Edge On News…Politics…Markets…Retirement…America…And More! You will never get rich by just sitting around. You need to take a proactive approach to your financial future. Bottom line: You’ll get valuable insight from expert contributors, Editor Zach Scheidt and our panel of distinguished analysts, including: Jim Rickards, Byron King, Gerald Celente and more. Our distinguished panel includes New York Times best-selling authors, macroeconomic analysis from former Presidential consultants, multimillion dollar hedge fund managers, Chicago commodity pit insiders, and more! 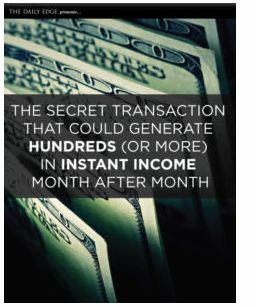 In this free report, you’ll learn how to use a moneymaking secret that is lurking right in your own stock account. Rich stock brokers have known this secret for years. But I want to show you how to use it for yourself. It’s a simple technique you can use to boost your portfolio’s bottom line in just minutes. And you can use this simple strategy in good markets and in bad. 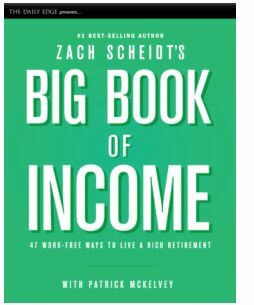 Inside this exclusive book excerpt from Zach Scheidt’s Big Book of Income: 47 Work-Free Ways to Live a Rich Retirement you’ll learn an instant income secret. As a Daily Edge reader, you get a sneak preview of this best-selling book. For generations, the thought of retirement filled workers with anticipation. The American dream was to work hard, be financially responsible and enjoy your golden years with friends and family. But for too many retirees, this dream has become a nightmare. And while the challenges for retirees are real, there are many alternative ways to generate extra income. The Big Book of Income will help you build your wealth and retirement, so you can focus on the things that really matter! Yes, I want the The Daily Edge email edition sent straight to my inbox, and I want access to the reports. We will not share your email address with anyone. Period. Your Peace of Mind Guarantee: Agora Financial is completely independent and unbiased. Should you ever wish to discontinue your e-letter subscription simply click the "unsubscribe" link at the bottom of each issue.